The DAX language provides several Time Intelligence functions that simplify writing calculations such as year-to-date (YTD), year-over-year (YOY) and so on. However, if you have a special calendar structure such as a 4-4-5 weeks’ calendar, you need to write your custom Time Intelligence calculation. In this article, you will learn how to write the required DAX formulas. The Time Intelligence functions in DAX (such as TOTALYTD, SAMEPERIODLASTYEAR and many others) assume that every day in a month belongs to the same quarter regardless of the year. This assumption is not valid in a week-based calendar: each quarter and each year might contain days that are not “naturally” related. For example, January 1st and January 2nd, 2011 belong to week 52 of year 2010, and the first week of 2011 starts on January 3rd. This approach is common in retail and manufacturing, which rely on 4-4-5, 5-4-4, and 4-5-4 calendars. By using 4-4-5 weeks in a quarter, you can easily compare uniform numbers between quarters — mainly because you have the same number of working days and weekends in each quarter. You can find further information about these calendars on Wikipedia (4-4-5 calendar and ISO week date). The goal of this article is not to explain how to write a Calendar table. There are too many variations and custom rules for each business, but the DAX pattern to use is always the same and this is the topic discussed here. You can build your custom Calendar table in Excel, PowerPivot or SSAS Tabular, and it works automatically for simple aggregation. However, if you try to calculate YTD or YOY using Time Intelligence DAX functions, you get invalid results because the assumption made by these functions is no longer valid. Colin Banfield wrote a useful Excel workbook to generate Calendar tables. Darren Gosbell offers an interesting Power Query script to generate a Calendar table. DAX is a powerful language built on a very small number of basic functions. All existing Time Intelligence functions can be rebuilt in DAX using mainly the CALCULATE, FILTER, and VALUES functions. With this in mind, you can build a calculation working on any custom Calendar table. Among the examples available for download at the end of this article is a sample ISO Calendar table. However, the DAX code can easily be adapted to any other custom Calendar table. By examining the function above, you can understand why the calculation does not work on a week-based calendar. January 1st is included into the year before, and the existing filter condition would fail this check. You cannot use the optional parameter of DATESYTD specifying the last day of a year to fix that, because typically the last day of the year is different each year. In the following picture, you see that the result shown in column Cal YTD is wrong. The first week of ISO Year 2011 inaccurately contains the first two days of January 2011, which in reality belongs to the ISO Year 2010. 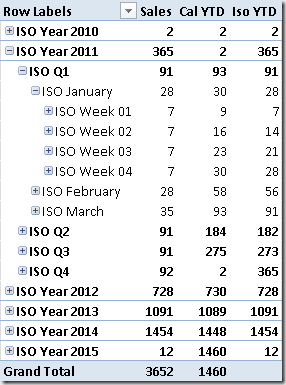 Column Iso YTD is correct. However, in order to obtain the desired result you can simply replace the test over column Year in the previous formula. The following is the definition of the Iso YTD measure, which you have seen used in the pivot table. You can use the same technique to write the quarter-to-date (QTD), month-to-date (MTD) and week-to-date (WTD) calculations. Behind the scenes, SAMEPERIODLASTYEAR iterates all the dates that have the same day and month from the previous year. This assumption is not valid in a week-based calendar, because the last day of each year (and of each period) can be different between different years. In the following picture, you see that Cal YOY returns a wrong value for ISO Week 09 in 2012, whereas Iso YOY displays the correct value. By using this column, writing the previous year calculation is simple. You just have to check that the ISO Year Day Number column is the same between different years. You might notice the same expression in two of the CONTAINS function’s arguments: the second argument defines the column checked for each row of the table passed as the first argument, whereas the third argument is an expression resolved in a scalar value before the CONTAINS function is called. Thus, the measure executes such expression in the row context defined by the outer FILTER function. You might easily get confused by that syntax! Finally, if you want to calculate the previous-year-to-date value simply merge the two techniques presented in this article. Use the ISO Year Day Number column (instead of using the date) in order to identify the corresponding day from the previous year as the last of the days to consider in the calculation. You can build many other calculations on a Calendar. In this article, you have seen the more important techniques needed to write Time Intelligence calculations over week-based calendars. You can also use the same techniques on any custom calendar, creating the columns (such as ISO Year Day Number) that can help you in writing a simple DAX formula. The ZIP demo file you can download below includes two examples, one for Excel 2010 and the other for Excel 2013.